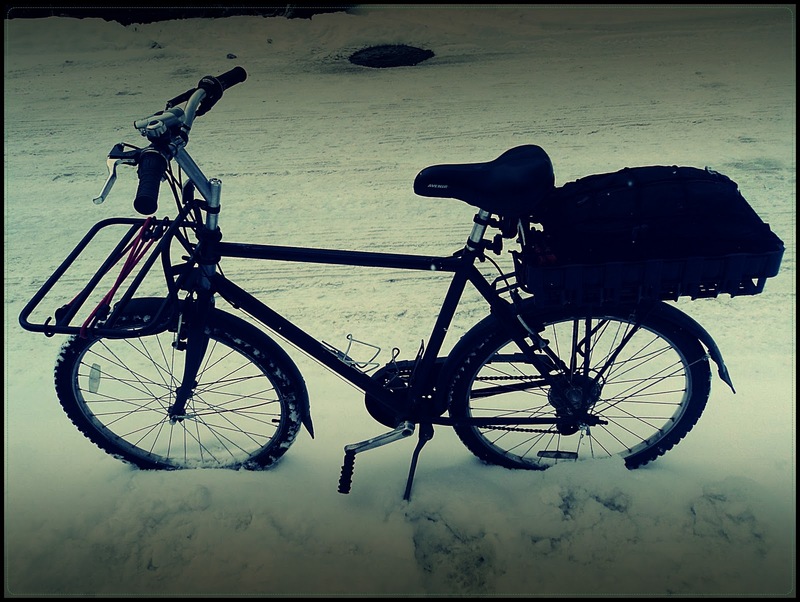 Well, after the recent spate of frigid and snowy weather I finally worked--a bit--on my winter bike...the Mundo, I've concluded is not meant for riding in extreme snowy and icy conditions. I hadn't ridden this bike in likely 8 months and have to admit I don't take the best care of it...it is, after all, my winter beater bike. But still I want it to ride well (and it does handle very well in the snow). Anyhow, the last time I rode this it was likely covered in snow and I brought it in an parked..no wiping down or cleaning. To make a long story short it was in rough shape when I approached it today...the chain was literally rusted to the flywheel, I had to pull it off with some effort. After much oiling and manipulation (and quite a bit of mess...the only place I have available to work on my bikes is in my house) I was able to get the bike in working order, but it still needs additional attention. One new thing I'm trying this season is the rear basket...I mounted a soda crate to the rear carrier (semi-permanently with 4 bolts) and use a bungee net to keep things in place; a person can get really spoiled with the carrying capacity of a Mundo. Anyhow, I took it for a ride today to run a few errands and it felt good. It felt good to be on such a "short bike" in the snow.